I find this discouraging because it is obvious there are some out there who don’t understand that some women have sacrificed themselves for the rest of us. Winning suffrage was just a start of us. I remember a time in the late 1960’s when I lived at home and worked at a job that gave me a decent income, more bucks than my father made, and yet he had to co-sign for me to buy a car and get a credit card. I still fight at the car dealerships because if I bring my husband in with me to buy a car, that credit-giving-guy–the one sitting behind that big desk in that huge glassed in office–assumes Frank’s name has to come first on “such” important paperwork. I finally had the courage to make one guy start over again on his “paperwork in triplicate” to that put my name first because I was making the payments. We are talking this is almost 100 years since we women have had some rights granted to us! Since given the vote, we women have been balancing on a pinnacle. Our freedoms are that fragile! There are those who’d like to take away our rights to make our own decisions. So what’s in it for me to vote? To protect my female rights--my 21st Century rights–to protect all women’s rights whether they believe the way I do about life, liberty, and our individual pursuits for happiness. We have only had these rights because of those women who were on the extreme side--willing to shout, march, and suffer –some to be jailed and force-fed when they went on hunger strikes fighting to earn THE VOTE. Others sat idly on the side-lines and called them fanatics. 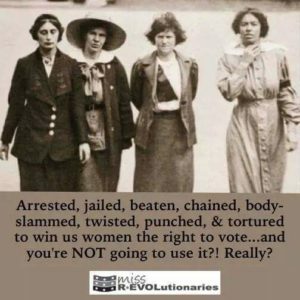 Yet the hardest fighters earned the right all of us women the right to vote. It may be a slow fight forward but we need to fight for equal rights in all that matters. It’s not too late. We have a few hours left. 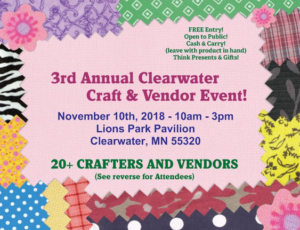 Just a reminder to drop in at the 3rd Annual Clearwater (MN) Crafts and Art Vendors Event this Saturday, the 10th, from 10-3. 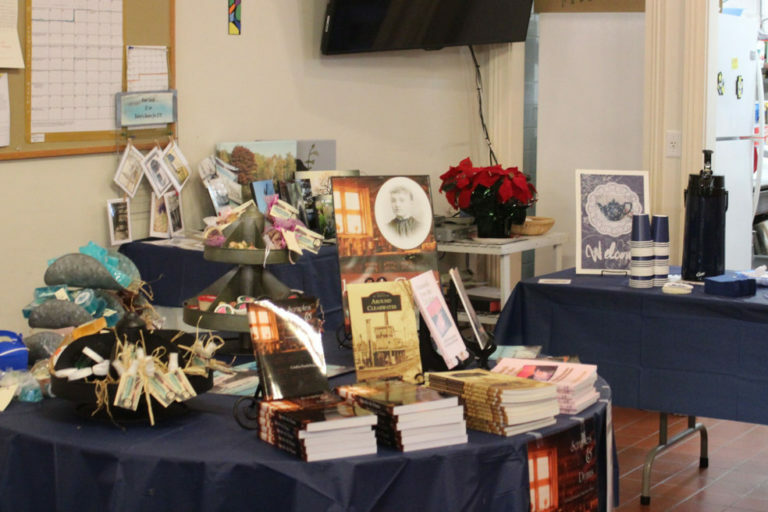 I’ll be signing books–Maude Porter, my protagonist, would be sad if you didn’t come. Great deals on Christmas presents. I am available for book talks and other Christmas teas !!!! 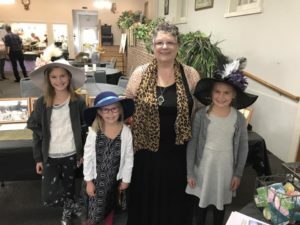 Yes, give me a buzz, at books@cynthiafrankstupnik.com and I’ll talk about my dynamic duo–Maude and Jennie–two of Minnesota’s Main Street Women! The clouds opened, and the day started with bright sunshine, illuminating golden oak and red and orange maple. 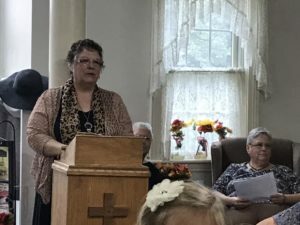 When we entered the Friendship Hall of the United Methodist Church in Clearwater, Minnesota, the kitchen workers were already there, mixing up chicken salad and cheese and bagel dips. My sister, friend, and I put final touches on the tables we had decorated the day before. This included hats, hats, hats. Soon part of our family arrived, and the granddaughters started to practice their modeling opportunities. My daughter-in-law and sister took some pretty awesome pictures of the afternoon. The program went well, the granddaughters, and Grandpa, seemed to get into the act. I saw friends I hadn’t seen for quite awhile. Food, friends, family, and fellowship–what more could I ever ask for? Oh, yes, I signed many books, hugged, laughed, and loved. 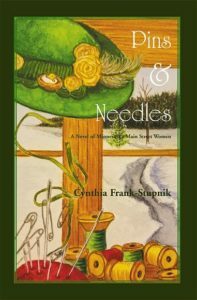 Pins & Needles, A Novel of Minnesota’s Main Street Women, will be available on Amazon.com soon. Otherwise, you can buy from me for $25.00 plus tax and s/h. You can purchase any of my books from me at http://www.cynthiafrankstupnik.com/book. Send me a note and I’ll come and talk to your book clubs or other events and talk about my writing novels of Main Street Women, those strong women with vision who helped shape our country. 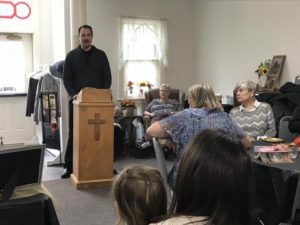 1:00–Introductions by son #2 and my blather for a few minutes, some hardy conversation about Maude Porter and Clearwater, a short style show, contest for prizes, and the cutting of the cake! What were some of the issues of the day and the future? What does WCTU stand for?What does the Edwardian period in clothing trends stand for? What does this mean for women’s styles? And most of all, what were the latest inventions or trends to hit the world and Clearwater? For those from the Clearwater area and/or have read my history, memoir, and Scruples & Drams, name some of the founders of Clearwater. The protagonist of Pins & Needles, Maude Porter, was the child of a husband and wife team of founders. Name one thing for which each person was known around the village. There are a number of them …. One founder was a brother to a famous Minneapolis founder. I hope to see you there for this fun and frolicking day to celebrate the Pins & Needles launch into the world. BOOKS arrived–what a joy to hold in my hand the symbol of all my hard work–researching, writing, editing, editing, more editing, and many, manty rewrites. Thank you to all my friends and relatives for your input. Remember! Costumes and hats are optional. Feel free if you want to represent the era. 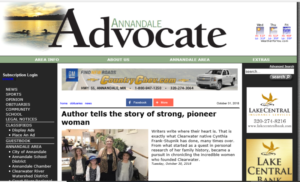 Maude Porter, the novel’s protagonist, and Clearwater’s leading citizen would be overjoyed that we were honoring her. We will have a short style show. Hats are nearly finished and hanging around the house. Here is another sample. 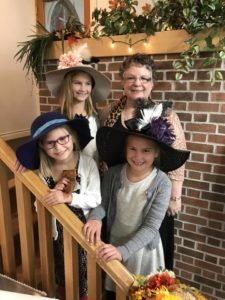 Granddaughters are coming to create theirs this weekend–with Grandma’s help. Invitations and posters sent and placed. (Feel free to give me some clues to place or send a few more). 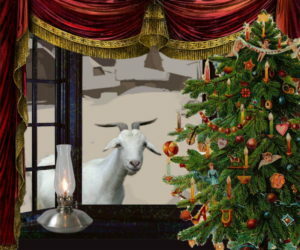 Sister Becky has prepared a story line of pictures–they are adorable. Doesn’t this entice you to want to read the latest novel in the Minnesota Main Street Women series? “” and others have items of historic ephemera for display. Cleaning up MY messes next week so company has a clean place to sit around the house–also trying to organize so I can take a couple loads down to the church Friday, the 12th. Gifts bags for door prizes are getting pulled together…surprise, surprise, surprise. Son Todd is practicing songs for the 12:30 time for meet, greet, eat. We hope to start on time at 1. I hope to cut the cake at 2:00 so stay for a slice! 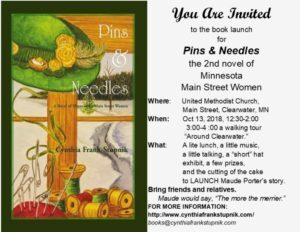 I am preparing for my upcoming the book launch of Pins & Needles, A Novel of Minnesota’s Main Street Women. 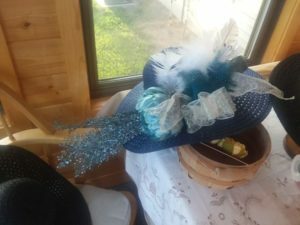 Since Maude Porter, the protagonist, is a milliner, I am taking up my own pins and needles, along with glue, feathers, ribbons, and flowers to design a few hats that she might have created. Mind you, I am NOT a sewer so my glue gun and other types of heavy glue are my friends. I am not that creative with paint brushes, colors, or scissors so these are being used very sparingly. Can’t wait to see all of you. 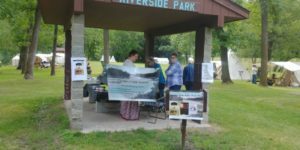 Maude Porter’s narrative takes place in the Mississippi River town of Clearwater, Minnesota. 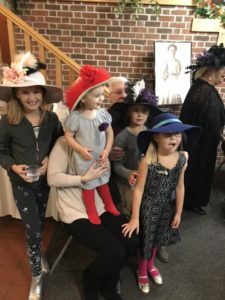 Daughter of village founders Tom Porter and Abigail Camp Porter, she owns a millinery store upstairs of Boutwell’s Hardware Store. From here, she can keep her eye on the comings and goings of the village. What she sees causes quite a commotion, but what she hears over her newly installed telephone could spell trouble. In this sequel to Scruples & Drams, readers see what life is like in the late 1800 and early 1900’s for the “new women” who were educated, strong-minded, and holding down careers. 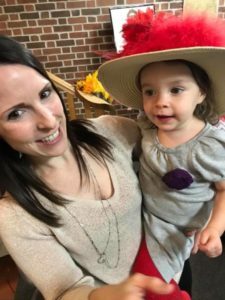 Women like Maude have concerns about the health and well-being of many women who are overworked, under-educated about their bodies, and become pregnant way too often. While Maude understands that suffrage and equal rights are important, she also sees how the consumption of alcohol ruins families and communities and causes some men to be brutal. At first Maude believes education is the key to ridding the town of the many drunks and their brawls outside Quinn’s Saloon. Ultimately, though, she and others, men and women, come to realize that prohibition is the only answer to setting their world in order. For Clearwater, the answer is clear: shut down Pat Quinn’s Saloon. Executive Director, The Matilda Joslyn Gage Foundation, Inc. So come one, come all, to my book launch –Oct. 13, 2018, at the Clearwater United Methodist Church, Clearwater, Minnesota. 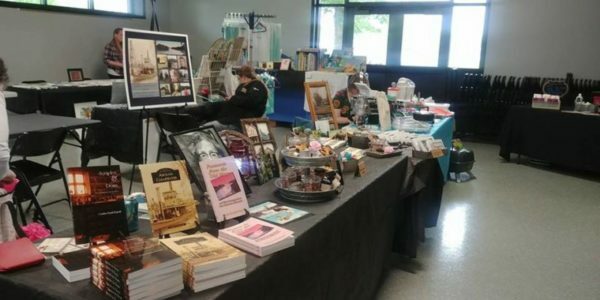 Starting at 12:30, we will have music, lite snacks, cake, coffee, book signing, and around 3, a walking tour of the locations I write about in my books. In this historic novel set in 1909 Maude Porter and Jennie Phillips balance their careers with fighting for women’s basic rights – some openly, others behind the scenes. These old friends, who we met in Cindy Stupnik’s earlier Scruples & Drams, continue to face fearsome adversaries with growing courage and conviction. 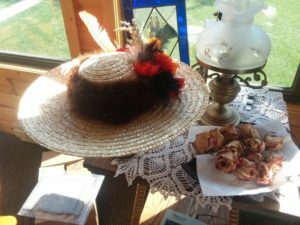 Along the way, we meet the historic characters who populate the village of Clearwater, Minnesota and get a flavor of early white settlement and its challenges. Stupnik has a gift for drawing us into the time and place, and this book hits the mark. In addition, if you pre-order Pins & Needles, you will receive a 30% discount when I launch the book in October. This week, Pins & Needles was wrapped up and sent to the printer. I am so happy with the cover and the story. I have had excellent editors along the way. I hope you enjoy it as well. It is the second in my Minnesota Main Street Women series. My next book will be the prequel. Once you have read Maude Porter’s story in the new novel, you’ll know who the protagonist is in the next story. For the next couple weeks, I am offering my author’s discount for anyone wanting to place a pre-order with me. From 28.99 down to $20 and 1/2 price shipping (for a total of $22) unless you come to the book launch in mid-October in Clearwater, Minnesota, at the Clearwater United Methodist Church when and where shipping is free. 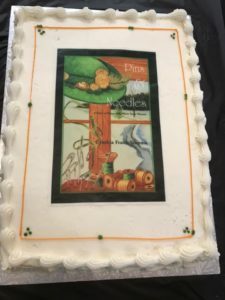 AND this is where I’d love to see you to help launch this new book, have some fun, and eat cake. Unfortunately, I can’t give a positive launch date, but the book is at the publisher/printer. Library on Saturday at 11 until 12. Before and after this, I’ll be at the dam Saturday and Sunday. I’d love to see you. I will be bringing most of my books— to sell and sign. 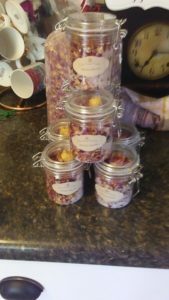 We will have some of our “SUNDRIES” to sell as well–soaps, bathroom sprays, lotions, face creams.